Almost everyone likes to make a customization to their vehicle. A custom plate, additional lights, and more powerful sound systems can all be installed by most individuals with relative ease. However, some like to take it a step further and modify their vehicles in even greater fashion. Some who are more serious when it comes to automotive work may like to make major alterations to their vehicles or even build a new one altogether. For major customization, reconstruction, or serious maintenance, it is very important to be able to approach the job from any angle. In order to do this, powerful equipment is needed. Best Buy Auto Equipment understands that those who are serious about working on vehicles as a personal hobby or for a living needs powerful auto rotisseries to help them compliment their skills. Body and frame work can sometimes be a bit stressful, as everyone wants to make sure that the unit stays safe during the entire process. Our impressive array of rotisseries is guaranteed to provide the stable foundation for any job, with some models boasting capacities of over 3,000 pounds. Solid steel parts and modern technology allows these units to hold automotive components steadily and allow for easy access and a more work-friendly setup. However, it shouldn’t be thought that the sturdy nature of these devices creates a rigid or unmovable work environment. Truly detailed work requires that a unit be approachable angle. Many of these models feature adjustable heights and 360 degree rotation capabilities. 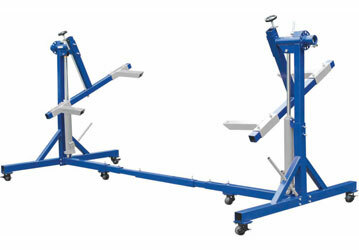 Hydraulic cylinder systems allow these auto rotisseries to support, balance, and rotate body’s and frames safely. Built to be durable, these units are made with prolonged use in mind. For those who are serious about working on vehicles either for themselves or others, there is no substitute for more control. An improved working perspective makes for a better finished product every time. When you’re working with intricacy, detail, and precision in mind, the most versatile and stable setup is the best foundation for skills to be shown on. Utilize these high-quality auto rotisseries to customize, service, and modify a frame from every angle.